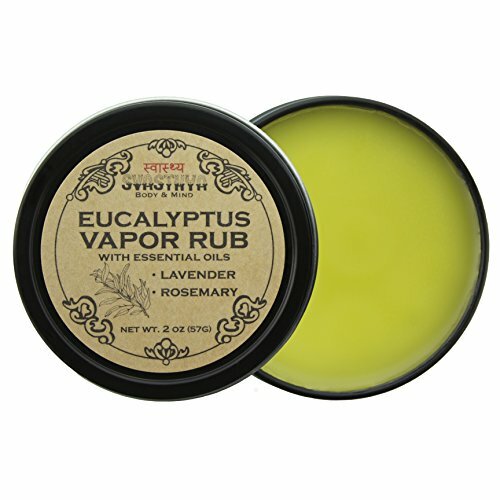 Our All Natural Eucalyptus Vapor Rub opens your nasal passages while gently moisturizing your skin and revitalizing your spirit. Our petroleum-free formula allows you to breathe easy with only 5 SAFE, NATURAL and EFFECTIVE ingredients including Extra Virgin Olive Oil, Beeswax, and Eucalyptus, Rosemary and Lavender Essential Oils. Eucalyptus Essential Oil is antibacterial, antifungal, antimicrobial, antiviral, anti-inflammatory and decongestant in nature, giving it the ability to stimulate immunity and improve respiratory circulation. It is known to be effective for treating a number of respiratory problems including cold, cough, runny nose, sore throat, asthma and nasal congestion. Rosemary Essential Oil has analgesic, antibacterial, antifungal, anti-infection, anti-inflammatory, antioxidant, and expectorant properties. The scent of the oil has been shown to provide relief from throat congestion, and in treating respiratory allergies, colds, and sore throat. Lavender Essential Oil is especially useful for respiratory disorders and symptoms such as colds, influenza, coughs, and sinus congestion. Inhaling this essential oil can ease breathing problems when phlegm is trapped within the sinuses and lungs. In addition it is one of the most effective natural treatments for headaches. These 3 powerful all natural oils combine together to give you the perfect natural and effective go to for cough and congestion relief. For relief from cough and congestion apply to chest and soles of your feet. Dab under nose to revitalize your spirit and awaken your senses. All natural formula makes our vapor rub safe to use as often as needed. Non-habit forming. No harmful, artificial ingredients added, making it safe for the entire family. No petroleum by-products, No Harmful Preservatives, No Parabens, No Sulfates, No Artificial Colors, No Artificial Fragrances. Made in the USA and Never tested on animals. If you have any questions about this product by Svasthya Body & Mind, contact us by completing and submitting the form below. If you are looking for a specif part number, please include it with your message.